Garnering much recent interest by dairy producers and their nutritionists has been a new method of harvesting whole-plant corn for silage. The resultant product has been called corn shredlage by the developer of the process (Shredlage™, LLC; http://www.shredlage.com/) and the manufacturer of the new processing rolls used in the process (Scherer Corrugating & Machine, Inc., Tea, SD; http://scherercorrugating.com/). Although a recent development with limited information available, in this article we will provide responses to the most frequently asked questions concerning this topic. We conducted a feeding trial with corn shredlage fed to lactating dairy cows at the UW Blaine Arlington Dairy during Oct. – Dec., 2011 following a September, 2011 harvest at UW Arlington Agricultural Research Station (AARS), and will rely heavily upon that harvest experience and feeding trial results for our response to these questions. What is different about the corn shredlage method of harvest? Corn shredlage is silage produced from whole-plant corn that has been harvested with a commercially-available self-propelled forage harvester (SPFH) fitted with aftermarket cross-grooved crop processing rolls and the SPFH set for a longer theoretical length of cut (TLOC) than commonly used. At the time of writing this article, these rolls have only been adapted on Claas SPFH, although the manufacturer has indicated that kits are being developed for John Deere SPFH too. 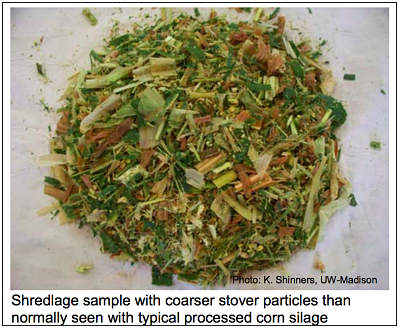 What is different about corn shredlage compared to normal processed corn silage? Compared to normal processed corn silage harvested with the chopper set at 19 mm TLOC, the most obvious difference for corn shredlage harvested with the SPFH set at 30 mm TLOC is a greater proportion of coarse stover particles in the shredlage. When fed in rations for lactating dairy cows, this can increase the physically-effective neutral detergent fiber (peNDF) content of the ration which is important for proper rumen function, cow health and milk fat content. The cross-grooved rolls used for producing corn shredlage may cause greater damage to the coarse stover particles and allow for greater digestibility of the NDF, but this has yet to be evaluated. With proper roll gap settings for both types of crop processing rolls differences in kernel and cob breakage would not be expected, but this has not been compared in detail to our knowledge. How were the corn shredlage and corn silage harvested for the UW feeding trial and what were the harvest and storage results? A 20 acre field at UW AARS planted with a dual-purpose hybrid was used for the study. One day apart in early September, 2011 half the field was harvested as corn shredlage (SHRD) and the other half harvested as normal processed corn silage (KPCS). The SHRD and KPCS were stored in separate side by side 10′ diameter by 200′ long silo bags and allowed to ferment for one month before commencing the dairy feeding trial. For harvest of the SHRD, a SPFH equipped with the new shredlage processing rolls was set for a 30 mm TLOC by removing half of the knives and the processor roll gap set at 2.5 mm. The SHRD harvest was done by a custom operator (Kutz Farms, Jefferson, WI) and SPFH was set up by Shredlage™ LLC and Scherer representatives. Some forage harvester manufacturers recommend not removing knives when harvesting whole-plant corn silage. The very long particle-size that results from removing knives can put added stress on SPFH components like the cutter-head and blower. Careful consideration concerning SPFH wear and longevity should be made by the SPFH operator before knives are removed when harvesting whole-plant corn silage no matter what type of processor is used. Harvest of the KPCS was done using the UW AARS SPFH set for a 19 mm TLOC and equipped with conventional processing rolls. The processor roll gap was not altered from that normally used by UW AARS for harvest of corn silage for the UW Dairy. The exact roll gap was undetermined, but appeared to be greater than 3 mm based on kernel processing results. For samples collected at harvest, the corn silage processing score (CSPS; % of starch passing through a 4.75 mm screen) was 50 for KPCS and 65 for SHRD. The SHRD and KPCS were similar in dry matter (DM; 35.0% ± 1.9 versus 34.7% ± 1.4) and starch (37.6% ± 5.2 versus 38.7% ± 4.9) concentrations, pH (3.59 ± 0.05 versus 3.61 ± 0.03), and silo bag packing density (17.5 versus 17.2 lb. DM per cu. ft.). The proportion of coarse particles was greater for SHRD than KPCS for samples collected during feed-out from the silo bags throughout the feeding trial (31.5% versus 5.6% retained on the 19 mm screen of the Penn State Separator Box). For the total mixed rations (TMR) fed throughout the trial, the proportion of coarse particles was greater for TMR prepared with SHRD than KPCS (15.6% versus 3.5% retained on the 19 mm screen of the Penn State Separator Box). Our measurements of weigh-backs during the trial did not reveal feed sorting for either treatment. What were the results of the feeding trial? Fourteen 8-cow pens, balanced by breed, parity and days in milk (DIM), were randomly assigned to either SHRD or KPCS treatment TMR (7 pens and 56 cows per treatment). At the start of the feeding, SHRD and KPCS cows were 114 ± 35 and 117 ± 36 DIM. All pens were fed a 50:50 mixture (DM basis) in the TMR for a 2-week covariate adjustment, followed by an 8-week treatment period pens received their respective treatment TMR containing 50% (DM basis) from either SHRD or KPCS. Both TMR treatments contained 10% alfalfa silage and 40% (DM basis) of the same concentrate mix comprised of dry ground shelled corn, corn gluten feed, solvent and expeller soybean meal, rumen-inert fat, minerals, vitamins and Rumensin®. Statistical analysis of the data was done using pen rather than cow as the experimental unit. Dry matter intake (DMI) tended (P < 0.08) to be 1.4 lb/day per cow greater for SHRD than KPCS, while milk yield (96.0 vs. 94.2 lb/day per cow for SHRD vs. KPCS) and feed efficiency (1.72 vs. 1.73 lb Milk/lb DMI for SHRD vs. KPCS) were similar (P > 0.10). Yield of 3.5% fat-corrected milk (FCM) tended (P < 0.08) to be greater for SHRD than KPCS (100.1 vs. 97.8 lb/day per cow for SHRD vs. KPCS). In Figure 1, FCM by week on treatment is presented. 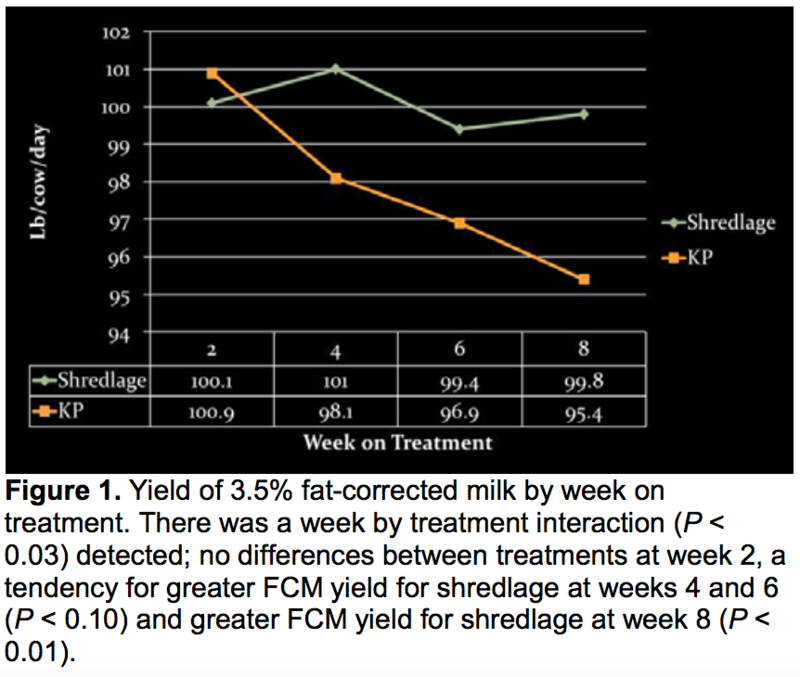 A week by treatment interaction was detected (P < 0.03); there was no difference between the treatments at week 2, FCM yield tended (P < 0.10) to be greater for SHRD compared to KPCS at weeks 4 and 6, and FCM yield was (P < 0.01) 4.4 lb/day per cow greater for SHRD than KPCS at week 8. Milk fat, protein and urea-nitrogen contents were unaffected (P > 0.10) by treatment and averaged 3.72%, 3.20% and 13.8 mg/dL, respectively. Body weight (1561 lb. on average) and condition score (3.04 on average) and body-weight change (0.65 lb/day per cow) were similar (P > 0.10) for the two treatments. Are there different guidelines for using shredlage in dairy diets compared to corn silage? To the extent that the stover particle length can be increased while maintaining adequate kernel processing, the use of corn shredlage may allow for the feeding of higher forage diets. Assess particle size of corn shredlage as an indicator of peNDF and CSPS of corn shredlage as an indicator of starch digestibility to determine what ration adjustments may be warranted. More data is needed regarding NDF digestibility for corn shredlage and the relative peNDF for corn shredlage compared to hay-crop silage, whole cottonseed, and chopped hay or straw, to allow for better decisions on how best to utilize corn shredlage in dairy cattle diets.